On the morning of Sunday December 9, The brightest asteroid Vesta will be in opposition to the Sun, close to the bright planet Jupiter. On Sunday (Dec. 2), the giant planet Jupiter reached opposition with the sun, lining up directly opposite the sun in the sky. That means it's a great target for stargazers, who can see it shine brightly all night long this week. Within the next two weeks, two more solar system bodies will also reach opposition right alongside Jupiter: Vesta and Ceres. Seven years ago, these would be described as the solar system's two largest asteroids, which are a large group of small bodies whose orbits mostly lie between the orbits of Mars and Jupiter. The two charts below are snapshots of the same area of sky as it will appear on Dec. 9 and Dec. 18. All the background stars are the same in both views, but the three solar system bodies, Jupiter, Vesta, and Ceres, all jump slightly to the right between the two views. In general, planets and asteroids all move from right to left across the starry background, in what is called normal or prograde motion. However, close to opposition, the Earth is actually moving faster than the outer planets, so from our perspective they appear to move from left to right, in what is called retrograde motion. Since all three of these objects are within a couple of weeks of opposition, they are all showing retrograde motion. Nine days later, on the morning of Tuesday December 18, Ceres will also reach opposition, right between the “horns” of Taurus, the Bull. Asteroids get their name partly because of their small size, as they are all too small to appear to us as anything other than stars in the night sky. They give themselves away only by their motion, which reveals they are not actually stars, but something much closer. 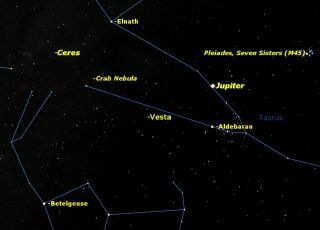 Both Vesta and Ceres are slightly too faint to be visible with the naked eye, but both are easily visible in binoculars. If you observe them even a day apart, you will be able to see their movement against the background stars. Both these objects are currently being studied up close by NASA's Dawn spacecraft. Dawn was launched on Sept. 27, 2007 and arrived at Vesta on July 16, 2011. It spent just over a year studying Vesta, and then left on Sept. 5 of this year for Ceres. It will arrive there in February 2015 and spend at least a year in orbit.